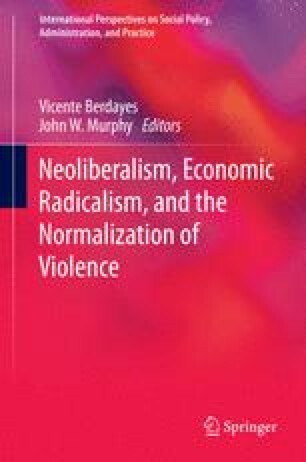 The study of commercial media offers one of the best ways to gain an understanding of the role of violence in contemporary society, not in terms of an instrumental concern with “the effects” of violence on individuals, though this question has some limited importance, but rather in the sense of how, within the contemporary neoliberal context, media systematically normalize and justify violence as an outcome of their commercial organization. Such an approach focuses on several aspects of how media operate including (1) how commercial media collapse the distinction between news, entertainment, and advertising, (2) how conceptualizing audiences as commodities leads to their segmentation and isolation, (3) how this process of segmentation breaks down the possibility of reasonable democratic deliberation while (4) reinforcing biases and other polarizing dynamics among audiences, (5) how violence and the production of enemies serve useful marketing goals within commercial content, and (6) the role of commercial media in the broader neoliberal political economy. This chapter examines these intertwined questions by taking Yahoo! News as a case study of commercialized media content and exemplar of contemporary sophism. DiGangi, C. (2014) Debt collectors harass debt-free woman for years. Yahoo! Finance. “http://finance.yahoo.com/news/debt-collectors-harass-debt-free-120000528.html.”. John, A. (2014). Ad paints President Obama an awful lot like an abusive boyfriend. Yahoo! News. http://news.yahoo.com/ad-paints-president-obama-awful-lot-abusive-boyfriend-130958144.html. Lynch, J. (2014). Yes, Obama’s White House is more secretive than Bush’s. The Week. http://theweek.com/article/index/264536/yes-obamas-white-house-is-more-secretive-than-bushs. Patrick, K. (2014). Obama’s LGBT executive order threatens religious liberty, say advocates. Yahoo! News. http://news.yahoo.com/obama-lgbt-executive-order-threatens-religious-liberty-advocates-201628842.html. Ruane, J. (2014). Public records—now online. Instant Checkmate. http://www.instantcheckmate.com/pr?src=YAHOO&mdm=DISPLAY&cmp=YAHOO&cnt=ECIG&affid=107&campid=314&sid=YAHOO&s1=ECIG&lp=pr&no_pop=true. Stableford, D. (2014). Read Hillary Clinton’s 1971 letter to Saul Alinsky. Yahoo! News. http://news.yahoo.com/hillary-clinton-saul-alinsky-letters-155526953.html.